At the moment, I have a rental property in Surrey. I had no idea things would turn out this way, you can say I became a landlady by accident. I was living there, but working a job I hated, and I really wanted to do something else with my life. So I made one of those crazy life changing decisions and moved overseas, converting my place into a rental. It has gone very smoothly so far, thanks to the best tenants one could hope for. They take care of almost everything, from the heater that broke last winter to replacing the washing machine, they are the ones on sites and I just pay the bills. We communicate mostly via emails and at times I don’t hear from them in months. But I have been in land lording hell too, and want to share that little check list so you don’t end up there as well. 1. How will you pay the mortgage? With rents. I know, sounds like a stupid question. Have you checked out Just Buy To Let mortgages and all the other companies offering buy to let mortgages to see how much you will have to pay monthly? Buy to let mortgages have a slightly higher rate than normal mortgages, so your payment will be higher. How long can you go without a tenant? Having 6-12 months rent in cash is wise if you can’t pay the mortgage on a month to month basis with your other sources of income. 2. Who pays the bills? I chose to cover all the bills, council tax, water, TV license, etc. and then charge a higher rent to my tenants. It is a win-win for a number of reasons. The tenants are happy because they know exactly how much rent will be, and that it includes all their housing costs. They don’t have to get together once a month when bills come and split them, getting bitter because Bob spent more time in the shower than Melanie (I know, who would think the lady would shower that fast! ), or when Ted refuses to pay for cable as he never watches TV. By signing the rental agreement, my tenants agree to pay their share of the bills via their rent. As a landlady, I win because I know the bills are paid. I paid them myself. I won’t go back to my property to find late payment letters from the TV license agency and have to pay them myself. Everything is neat and tidy. You can go either way but make sure you put everything in writing. 3. How long will you rent for? Will you want your property back once you start a family/get a new job/move back home? I rent to students and they are pretty flexible on the terms of tenancy, most of them renting for 6 or 12 months. You can choose a longer term, just think about your future plans to confirm it is a smart move. 4. Who will maintain the property? My perfect tenants keep the property clean and tidy, and when something breaks they give me a call, I approve the work, they send an invoice and I reimburse them. Other tenants will never be home to let a repair man in, meaning that water leak could turn into a disaster, or that you would have to go onsite to let the plumber in or do it yourself. Which is fine if you live nearby. I live on another continent. While not explicitly written in their contracts, my tenants are aware that I am not around to fix stuff and they always manage to do things themselves. 5. How will you get paid? One thing that surprised me in the UK, is no one asked me how much money I made in order to rent the 4 properties I rented before buying my own place. Don’t you want to know if your tenant will pay rent? A quick credit check, a couple of calls to confirm references from other landlords won’t cost you a lot of time and money, but it will certainly help you sleep at night. 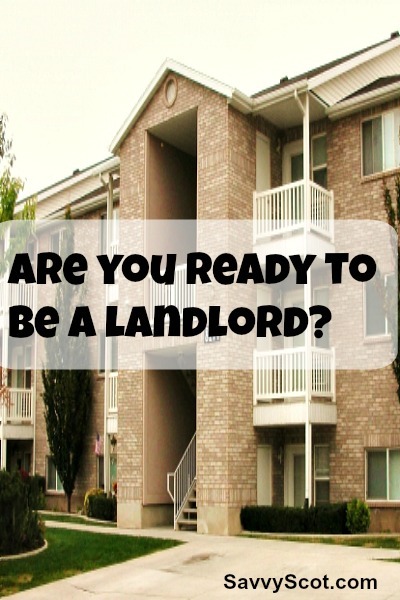 So, are you ready to be a landlord? We have been thinking about becoming landlords. A little nervous before we enter that part of our lives though. I am gearing up to rent my current place out in 2 years. That has always been my intention and I’ve stayed in my place a little longer than I originally intended. I would like to buy another place-a duplex and rent out the other side. Hopefully the guy that I end up marrying will be up for that plan! Specific landlord insurance is a must in my view too, ie not relying on ordinary house insurance to cover breakages etc. Hello Pauline – and welcome to this particular corner of the personal finance blogosphere! The final paragraph: I know what you mean, re. wondering why nobody asked you how you would pay the rent! Apparently a LOT has changed here in that respect, since the recession hit. My friends who are renters tell me that it is a lot different, and more difficult now: not only are rents higher, but the credit checks are far more widespread and rigorous. Hi there Miss Thrifty! Well I was really surprised because in France it is mission impossible to rent a place without proving you earn 3 to 4 times the rent, net. Tenant protection is strict and it can take 18 months or more to evict so landlords are very cautious. I liked that it was so easy in the UK, but as a landlord I take a few precautions still, better safe than sorry.